Allegri’s team executed an excellent strategy which saw them take advantage of Real Madrid’s instabilities to give them a 2-1 lead to take to the Bernabeu. Despite the absence of Karim Benzema, Real Madrid maintained their 4-4-2 (albeit with slightly different dynamics in attacking midfield) with a front partnership of Ronaldo and Bale. Casillas was protected by a back four of Carvajal, Pepe, Varane and Marcelo whilst Ramos struggled throughout alongside Kroos in the centre of midfield. Ahead of them were James and Isco, playing very much as interiores although Isco particularly made multiple movements wide also. On the other hand, Allegri’s home side started the match in their common 4-1-2-1-2 shape which later moved into a 3-5-2 after taking the lead for the second time. Giorgio Chiellini and Leonardo Bonucci had excellent games in front of Gianluigi Buffon whilst flanked by Lichtsteiner and Evra at full-back. Pirlo often had far too much time at the bottom of the midfield diamond including Marchisio, Sturaro and Vidal, although you could also make the case for the Chilean to be classed as a forward and a defender at the same time as his central role. In attack, the partnership of Tevez and Morata proved to be pivotal for the Old Lady, especially on the counter-attack as typified in the build-up to the penalty for the winning goal. Especially early on during the game Real Madrid had some issues in defending with their 4-4-2, particularly in their coverage of Juventus 6 Andrea Pirlo. With Ronaldo in attack, the away side struggled in their pressing as the forward is incredibly passive which resulted in Andrea Pirlo having a decent influence in the game. Sometimes this was down to simple poor defensive work from the front two, such as in the third minute, where neither striker bothered to cover a simple pass into Pirlo who could then find Tevez with a precise vertical pass. Juventus did however use some methods to free Pirlo by removing the central presence of Bale, leaving the Italian pivot alone with Ronaldo, who was never going to attempt to press him. They executed this through creating an overload down their left flank with Vidal and Sturaro shifting across – forcing Bale to shift in support. A simple diagonal pass would then free Pirlo who had the time to progress the ball against Ronaldo. Juventus’ method of exploiting Ronaldo’s passivity. A key feature of the game was Juventus’ asymetrical shape which looked to exploit Ronaldo and Real Madrid’s left-flank. Between the full-backs, Lichtsteiner was much more attacking-minded in positioning than the left-back whilst he was supported by the lateral movements of Marchisio and dropping movements of Tevez into the right half-space. Through this focus, the Old Lady aimed to take advantage of a flank which was poorly protected up top considering the lack of defensive output. This was then worsened considering that Isco had little influence against the ball just deeper of his Portuguese teammate, which was highlighted in the opening goal which fell just short of the 8 minute mark. Marchisio can easily form a 3v2 overload to nullify any potential RM press, allowing him to play in Tevez for the opener. With Ronaldo so far back, Marchisio simply steps across to create the 3v2 overload. It is not only Ronaldo who is at fault for this situation (though he is the source of it), as there are issues with a poor spatial coverage in midfield, Varane is simply too narrow, Marcelo could be narrower also and finally, Kroos simply could’ve followed the run of Tevez to at least challenge the Argentinian striker. This has not been the first time where Ronaldo has caused his team defensive issues on his flank, as this scene is rather reminiscent of another 2-1 loss for Real Madrid, this time in Dortmund. Courtesy of RM on the German site. Another issue for Real Madrid was Sergio Ramos’ midfield role. Against the intense central pressure of Juventus where the likes of Tevez and Vidal in particular displayed incredibly hard-working performances, Ramos struggled massively. His distribution was very poor yet even when this had been an issue for most of the match, he continued to attempt long-ranging diagonal passes which ultimately resulted in a loss of possession. In addition to this, it seems like Ramos picked up a few tips on positioning from Alonso before he swapped the Bernabeu for the Allianz. In a number of cases his positioning was simply too close to his teammates, making the spatial distribution uneven and closing off passing options. Albeit, this is not as criminal as Alonso’s positioning given that he is blocking off the passes of Varane and not Jerome Boateng, but it was still an issue. On top of this, he often made movements wide which had no positive influence on the possession, as it made for a poorly balanced positional structure with little influence in the centre. The movements out wide would often simply be in the same lane as Carvajal, meaning that he was weakening the situation for his team. The Spanish defender made little contribution in the Madrid possession game, primarily in terms of ball circulation which could’ve otherwise been supported well by alternative personnel, such as Illarramendi who would’ve been arguably better suited to breaking down Juventus’ 4-4-1-1 in defence. With substitutions later on, Allegri changed into the old 3-5-2 of Conte’s Juventus – something which he commonly utilises to protect a lead as he aims to increase the defensive security. 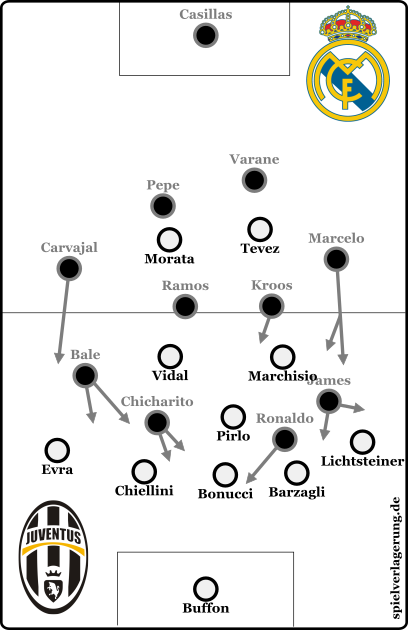 Within the shape there were some issues, particularly their lack of horizontal compactness in the Juventus third. However the opposition were never going to take advantage of this, as they aimlessly shifted to an even more counterproductive wing-oriented attacking strategy which provided little benefit against the three Italian centre-backs. The removal of a 4th central midfielder caused slight issues which could’ve been made much greater had the opposition been better strategically in attack. Particularly in the half-spaces, they held less stability which could’ve been utilised by Bale and James but in general the synergy of the Madrid attack was poor and they couldn’t work to access these areas. In summary, the main problems for Ancelotti’s team were a result of their own doing, as for yet another big game the defensive weakness which Ronaldo brings was taken advantage of. The inclusion of Sergio Ramos in midfield was a big error by the Italian ex-Juventus manager whilst the likes of Asier Illarramendi watched on from the sidelines. Credit obviously must be given to Juventus, whose attacking strategies worked effectively to take advantage of the weaknesses for Madrid. Allegri is proving to be capable of what Conte never was as the Old Lady go to the Bernabeu in a strong position to reach the final of the Champions League for the first time since 2003. In the tweet you linked showing Alonso disrupting Bayerns flow, how could he better position himself? Should he be closer to the middle and less in front of the right CB? How often does this Alonso scenario happen during the game? But I don’t understand the bit about Alonso’s positioning, care to elaborate or point me to an article that dissects this? Basically Alonso’s positioning is often quite bad for Bayern’s build-up, he’ll often be positioned too close to the center-back or be covering a passing lane. This reduces the passing options and simply gives the situation less potential. AO made a tweet earlier showing an example of this, but there’s nothing much else to say.